Employees who do not show improvement in their performance despite progress plans may require a termination letter such as this. 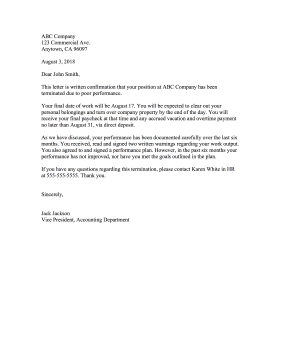 This letter is written confirmation that your position at ABC Company has been terminated due to poor performance. Your final date of work will be August 17. You will be expected to clear out your personal belongings and turn over company property by the end of the day. You will receive your final paycheck at that time and any accrued vacation and overtime payment no later than August 31, via direct deposit. As we have discussed, your performance has been documented carefully over the last six months. You received, read and signed two written warnings regarding your work output. You also agreed to and signed a performance plan. However, in the past six months your performance has not improved, nor have you met the goals outlined in the plan. If you have any questions regarding this termination, please contact Karen White in HR at 555-555-5555. Thank you.